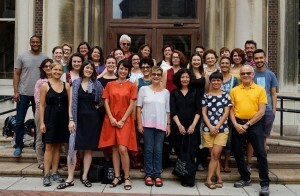 For its fourth international meeting on “Collaboration and Co-Resistance,” Women Mobilizing Memory gathered in New York in September. The group, consisting of scholars, artists and activists from Chile, Turkey and the United States, participated in a series of meetings and events that explored how the legacies of violent political histories might offer fodder for a more progressive and hopeful future. Previous meetings took place in Santiago, Montreal, and Istanbul. At this multidimensional meeting, the forty participants not only commemorated the anniversary of the 1973 Chilean coup and the victims of the Pinochet dictatorship, they also issued a solidarity statement and protested Turkish violence against Kurdish minorities. One member provided commentary on the crisis for the nonprofit news program Democracy Now. Click to see photos and video. The week began with a memory walk through Harlem, visiting both known and forgotten sites of art and protest that revealed the vibrant artistic and intellectual legacies of African American and some Anglo American institutions and individuals in the famous neighborhood. A group art exhibit at the Leroy Neiman Gallery at Columbia opened the same afternoon and was followed by an artists’ roundtable. “Collaborative Archives: Connective Histories” included the work of artists based in New York, Istanbul, Berlin, and Santiago. The artworks demonstrated how intimate objects and stories both animate larger painful histories and resist their violent force. For the group, the artworks remained points of reference throughout the week, offering images through which to imagine and reimagine histories of slavery, war, genocide, and political repression. Click to see photos and video. A second part of the exhibition, a curation of collectively produced posters, “CHILE: 40 Years of Struggle and Resistance,” opened at the Hemispheric Institute on Performance and Politics at New York University at the end of the week. The group also visited the September 11 Memorial Museum, analyzing and critiquing its official hegemonic strategies of memory. Click to see photos. A public conference, “Women Mobilizing Memory: Collaboration and Co-resistance,” brought working group members together with scholars and activists from Columbia and New York in a series of comparative roundtables on women’s strategies of political protest; on memory sites in Santiago, Istanbul and New York; and on the intimate archives of political violence. The discussions were enlivened by the interdisciplinary approach of the commentators and the focus on action, rather than mere commemoration. Click to see photos from all three panels and a Wishing Tree commemorative event, as well as video from the “Performances of Protest,” “Mobilizing Memory Sites,” and “Intimate Archives/Political Violence” roundtable discussions. Total immersion in repeated, face-to-face meetings throughout the week enabled the group members to evolve and to grow in their understanding of the material. Across the meetings, they had the chance to consider both the challenges and the benefits of transnational interdisciplinary work, and to practice their commitments to feminist solidarity and progressive social change.